It seems crazy to be saying this, but the holiday season is upon us! I tell myself every year that I'm going to start shopping earlier, but I always wait until after Thanksgiving and end up stressed out and running all over town to find the perfect gift for everyone on my list. I've done a little shopping and bought a few gifts, but there is still so much to be done! I may or may not have spent an hour in Target last weekend picking out wrapping paper, ribbon, and gift tags (sorry, Suzy!) and already burning my favorite winter candle, but at least I haven't turned on the Christmas music yet! 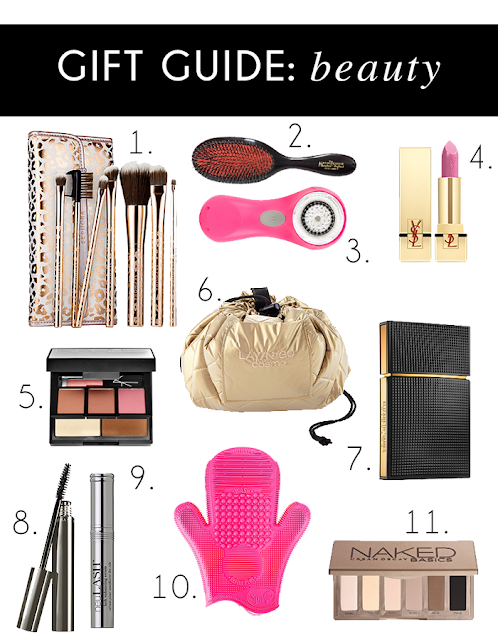 I wanted to start with the a beauty gift guide because this category can apply to so many people on your shopping list and is honestly my favorite thing to shop for. Lately I've become quite the little Sephora addict (woops!) and I don't know how I went so long without some of my new favorites! I will say, if there is something that you have your eye on or want to get someone that is made specifically for the holidays (like a beauty gift set), then go ahead and scoop it up now, because some of the things I wanted to include in this guide were already sold out! If you've got someone on your list who is crazy about their hair, this brush from Mason Pearson makes your hair so smooth and shiny! I bought mine with gift cards a few months ago and have noticed a huge difference in my hair! One of my absolute favorite new finds is the neuLASH serum. Pairing it with Chantecaille Faux Cils mascara has my lashes looking like I'm wearing falsies so it's perfect for the girl who loves to look glam! As much as I love cute little makeup bags, I save those for organizing things in my purse. I've been exclusively using this makeup organizer because it spreads out over the counter while your putting on your makeup and then when your done you pull the drawstring and it's all packed up! This would be great for the girl who doesn't have a ton of counter space like me, or the girl who is always on the go.